We were introduced to a few rules for our competition this month with the Poetry Seven – Laura set us a challenge that we had a subject – animals; a length limit – six lines, no more; and word specifications – we had to use the words spike, roof, and shadow. I like rules in poetry. I like structure and limits and boundaries – they can make the writer feel safe, and the creativity feel manageable. Until it doesn’t. I was fine with the rules – I was delighted with everything but the word specifications. I was stymied, thinking of an animal and these words in the same context. What animal with a spike could also be on the roof? Everything has a shadow, but with only six lines to explain and describe, who could come up with anything decent? Also, I was determined not to do anything… normal. I mean, why not, right? But that also meant that the line limit came back to bite me in the bum again. 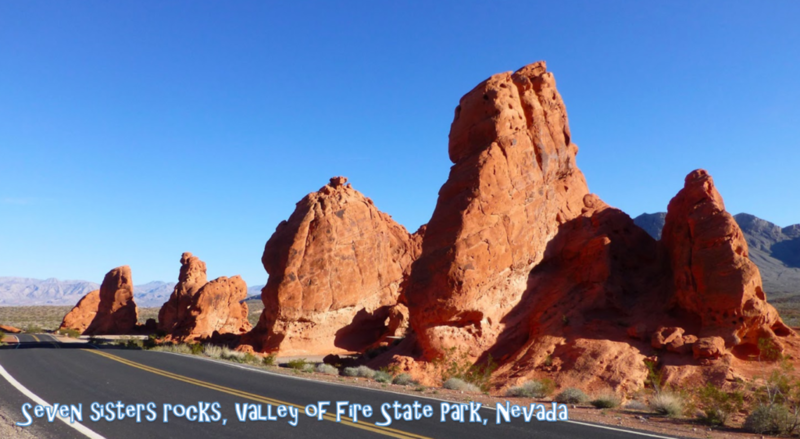 I was truly challenged – but also happy to run to the internet for some clues. I started with the line limit. There are quite a few amazing six-line poems, and poem forms. To give myself a place to begin, I decided on a plain hexastich – six lines, unrhymed – and then to play with an Italian sestet, which is iambic tetrameter or pentameter, and rhymed abcabc. My first poem is a Scotland poem. The symbol of Scotland is the unicorn, and with all the chaos of Brexit, more than ever, the unicorn, having sat prettily for a long while, is now poised to do… something about jumping over that fence, perhaps? This one is because I can never just leave Miss Emily alone, and so, hat tip to her A Narrow Fellow in the Grass (1096). In shadow, Snake is silent silk. Cold-blooded calm you must embrace! Oh, there’s more poetry. Laura’s first through the gate with her adorable guinea pig. (Oops, she chose to post the owl. I still like the guinea pig.) Sara joins with an autumnally atmospheric piece. Liz hits her stride and Kelly returns sans pangolin. (But her kitty’s still pretty cute.) And Tricia’s here, too, huzzah. Andi and Jax will gambol along shortly – I’m excited that the gang’s all here today. Tab’s hosting Poetry Friday today @ The Opposite of Indifference (and congrats to her Germany-bound son!). Enjoy your day – may it be filled with mysteriously awesome animals! Your narwhal wonderings made me laugh out loud and I really enjoyed the poem that emerged from it. I’ll admit that my heartbeat doesn’t spike when I see a snake or signs of one. I’m most likely to put my nose to the ground to find it! And finally, your unicorn poem. I think I took these words much too literally. Perhaps that’s why I struggled, but the unicorn is a stroke of genius. I loved all three poems! @MissRumphius: I ADORE snakes, so the poem A Narrow Fellow in the Grass always made me smile – but sympathetically, because I image Miss Dickenson’s Victorian peeps weren’t going to give her a lot of opportunity to hang out with snakes without being thought… unnatural, and possibly set outside of society even further. But, I still love the imagery. Love the narwhal so much. @WritingRuminating: Not gonna lie – stepping on snakes is NOT OKAY. At all. Ever. That would be HORRIBLE for sixty-elevnty-billion reasons. Now I need a pangolin. 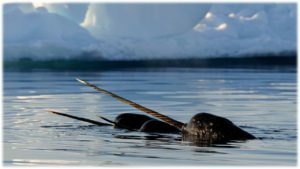 How can I resist a poem entitled “A Narwhal Never Flosses”????? It’s very Ogden Nash…and I LOVE O.N. But I’m also in love with a snake as silk….and adoring of a unicorn as “a force of dream and shadow”—sooooo lovely. Man. Three winners. Six lines is your jam, oh Poet. @saralewisholmes: …as specific words are obviously YOUR jam. And yes – it was O.N. I had in mind with the title! I loved memorizing him as a kid. I like that you used two literal spikes AND the one that happens inside your chest when you find the skin, but not the snake! Narwal for the win!!! Love it. That video is magical! And I DO love that poem. I might like your snake poem even more, though. Silent silk? Cold-blooded calm? Yes, please! You may have bucked against the restraints, but you’d never know it from your poems. What fun poems. Great alliteration in the reptile one. I think the narwhal is my fave though. Like you, I do wonder how that spike doesn’t get in the way sometimes. @jama: Since I couldn’t control much in the poems with a predetermined length and specific words, I really worked hard to try and force internal rhyme and alliteration – I had a lot of fun with these! I love that narwhal poem. So clever how you used the three words with alliteration, rhyme and repetition to pack so much into those short lines. Thanks for the video too – it’s lovely. @Andi: I’m so glad you’re back in the game today! This was such a hard challenge, but really fun – and I’ve put seeing a narwhal in person on my list of Things To Do…! These are so great and I’ve got to say I’m a wild fan of the unicorn poem. Everyone seemed to struggle with the assigned words this month but what I love is all the different ways they’ve been spun out — so one spike is not like the other, so each shadow is different. So lovely. And, in the case of the snake, creepy! 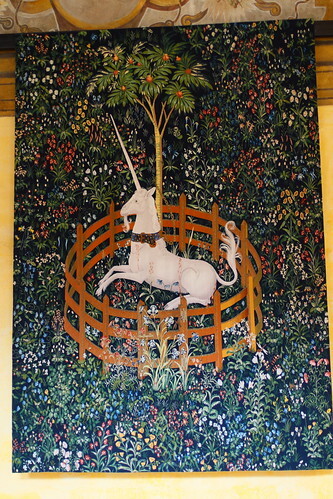 @Liz Garton Scanlon: You’ll have to see that tapestry in person someday – it’s truly gorgeous. We both hit on animals who are not universally adored, but I do love how the snake slipped in at the last minute!